SAN ANTONIO — Cargo aboard specific Mexican trucks and bound for the United States will soon be inspected by American officials south of the border and allowed to circumvent the lines at ports of entry, a top Mexican diplomat announced Thursday. Mexico’s ambassador to the United States, Arturo Sarukhan, said the countries are just days away from unveiling the initiative, which he said would be a giant step toward eliminating hourslong waits for cargo companies approved for the program. The start date for the initiative isn't certain. The ambassador said there initially will be three inspection sites on the U.S.-Mexico border, and said U.S. Customs and Border Inspection officers will be in Mexican territory conducting the inspections. When asked specifically where, and if those sites included the border cities of Nuevo Laredo or Ciudad Juarez, which border Texas at Laredo and El Paso, respectively, the ambassador demurred. “You will hear about them very, very soon,” he said. Companies have to apply and be vetted by both governments before they are approved, Sarukhan said. The news was greeted with applause from the hundreds of government, trade and logistics officials in San Antonio to celebrate the 20-year anniversary of the massive free-trade agreement, which has enabled more than $1.2 billion in daily trade between the U.S. and Mexico. Sarukhan said that the post-9/11 environment has led to the gridlock witnessed at most land ports because cargo inspections are not “intelligence-based” but instead indiscriminate. The ports of Laredo and El Paso have continuously been Mexico’s No. 1 and 2 trade destinations, respectively, and Mexico is Texas’ largest overall trading partner. The U.S. is Mexico's third-largest trading partner, following Canada and China. 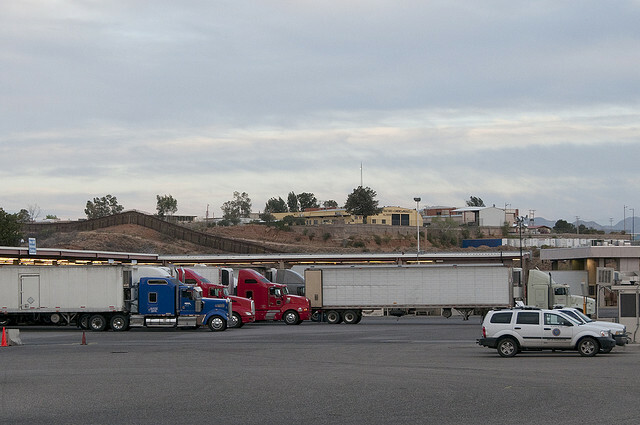 Through September, about $172.5 billion in goods passed through the Laredo port and about $65 billion through El Paso, according to United States census data analyzed by WorldCity, which tracks global trade patterns. Before the announcement, Sarukhan told the Tribune that Mexico’s president-elect, Enrique Peña Nieto, who will be sworn in Dec. 1, will probably continue the efforts that have made Texas such a major factor on binational trade. “I think the president-elect and his team have been very clear in what they see as the importance of NAFTA. I think they belong to a generation of Mexicans who are in many ways the NAFTA generation, and they have seen the positive impact NAFTA has generated,” he said. Sarukhan also lauded the efforts of outgoing Mexican president Felipe Calderón, who he said had helped modernize and expand trade infrastructure like no president in recent history. “No ports of entry [had] been built in over a decade,” he said. “We now have five that have been built in this administration. The latest one will be in Matamoros [across from Brownsville], so I think this is a very important trend,” he said. Calderón’s exit may also signal a change for Sarukhan, who has held the post since January 2007 and also served as a member of Calderón’s presidential campaign and transition team in 2006. When asked if he would be willing to serve in the same capacity under Peña Nieto, the ambassador said it wasn’t entirely his decision. This article originally appeared in The Texas Tribune at http://trib.it/Wbv1w1.